Guess who’s still playing catch-up! 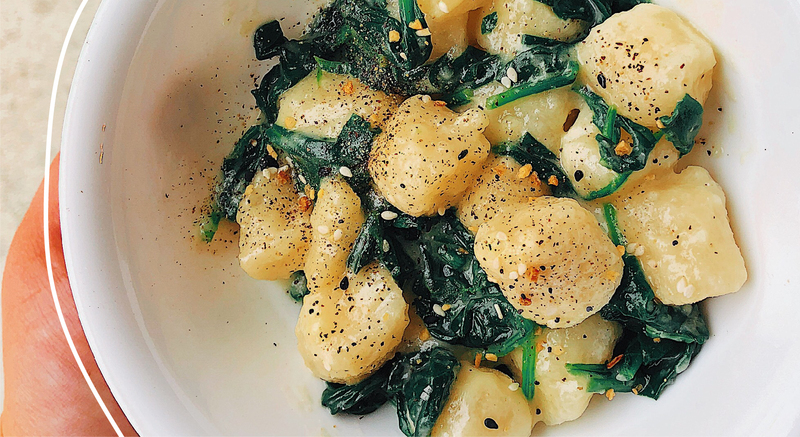 Here is a Weight Watchers Cauliflower Gnocchi recipe I’ve been loving, that has even gained some popularity on Instagram! Disclosure: some blog posts and web pages within this site contain affiliate links! This means I may earn a small commission if you click the link then purchase a product or service from the third-party website. There have been so many hyped up products within the WW and weight loss community as of late. Built Bars, My Bizzy Kitchen pizza dough, and even Smart Sweets Gummies have been taking social media by storm. However, I’m throwing things back a bit in an effort to make up for my recent blogging absense. Therefore, today I’ll be talking about Cauliflower GNOCCHI! Everyone and their mom has been eating it! This gnocchi is one of the most recent cauliflower products release from Trader Joes, who we all know reigns supreme when it comes to cauliflower food products. As an Italian-American and general human being with good taste in food, I can proudly say that gnocchi are where it’s at! Traditional Italian gnocchi di patate are soft little dumplings made out of potatoes, flours, eggs, and even cheese, so naturally they are my favorite primo piatto dish. In fact, when I was in Rome and Florence this past summer, I must have eaten gnocchi every single day. You know what they say, when in Rome, eat gnocchi. Well, maybe they don’t say that, but they should. And now I’ll say this…when at home, eat cauliflower gnocchi! Seeing as traditional gnocchi are made from potatoes, they don’t exactly get rave reviews for being point-friendly on WW. That’s where these Trader Joes Cauliflower Gnocchi come in, as they are cut with 0 SmartPoint cauliflower. A one cup serving of this product comes to 4 WW Freestyle SmartPoints, which is far better than the 7 SP average traditional gnocchi have. Dare I say they taste just as good? Keep reading to see how I prepare this comforting dish! In a small pot or pan, begin to steam cook spinach with water on a medium heat. Once leaves begin to soften and the water has mostly evaporated, drop in the gnocchi to begin cooking. If there is still too much water left, drain and use a quick spray of cooking oil on the gnocchi to avoid burning and sticking. A very small amount of water should still be in the pan/pot for the sauce. As the gnocchi begin to soften, add in cheese, butter, and seasonings, then continue to mix everything together until a light melted sauce has formed. Continue to mix until gnocchi are cooked all the way through. Approx 6-7 minutes. Many people like to fry their cauliflower in a pan alone with a small amount of oil or cooking spray. This will result in firmer gnocchi since the cauliflower is notorious for becoming soft. Both methods work well for the recipe, but since I’m a fan of one-pot cooking, I throw everything together at once. As a result, the gnocchi are a bit softer, but I find that they complement the cheese and butter well that way! As always, I recommend experimenting to determine which method works best for you. That’s all guys! I’d love to hear your thoughts if you give this recipe a try. And if you do make it, snap a photo on Instagram and tag me so I can admire all your yummy creations. Also, don’t forget to check out my most recent recipe, Maple Brown Sugar & Cinnamon Overnight Oats if you haven’t already! As always, wishing you a happy and healthy rest of your day, and thank you so much for stopping by Lose it Lyss!